British police have evacuated neighbouring homes in Surrey due to “concerns around items found at the address”. BRITISH POLICE HAVE sent a bomb disposal squad to the house of the family killed in the French Alps, after finding possible explosives in the latest dramatic twist in the case. Police also evacuated neighbouring homes after the discovery at the home of Iraqi-born Saad al-Hilli, who was shot dead with his wife and mother-in-law in their car at a beauty spot in eastern France last Wednesday. The local Surrey police force said they had evacuated the immediate area around the Hilli family home in the village of Claygate, southwest of London, due to “concerns around items found at the address”. An assessment of items found at the address is currently being carried out as a precaution. A source close to the inquiry said that a “potentially explosive substance” had been found at the home but did not say what it was. This morning, police suddenly moved back reporters and widened the cordon around the house after armed officers arrived at the mock-Tudor-fronted house. The army bomb squad arrived later, while forensics officers could also be seen searching the driveways of neighbouring homes. French police say they are not solely focusing on the theory that it was an “ordered execution”. Police are hoping to obtain key information from the seven-year-old daughter of a couple shot dead while on holiday in the French Alps last week. Zainab al-Hilli was brought out of an induced medical coma on Sunday, according to France24. She had been airlifted from the scene on Wednesday with critical injuries after being shot in the shoulder and beaten violently across the head. Detectives are now waiting to question the young British girl but have been warned that she is still under sedation and her speech is not yet audible. Zainab’s four-year-old sister Zeena has returned to the UK with two family members. She escaped the cold-blooded attack unscathed and hid under her slain mother’s legs for about eight hours before she was found by gendarme. Police said she was not able to provide any information. Local prosecutor in charge of the investigation Eric Maillaud explained that Zeena was “extremely traumatised”, adding that there was no question of rushing the process. The girls’ father Saad (50), his wife Ikbal (47) and a 74-year-old relative were all killed in the shooting. They had been travelling in a BMW vehicle on an isolated Alpine road near Lake Annecy, where they were holidaying. Local cyclist Sylvain Mollier (45) was also killed after apparently stumbling on the scene. He has been described as being in the wrong place at the wrong time. All four victims were shot twice in the head, autopsy results revealed on Friday. Twenty-five shots were fired in total. France24 reports that there is a team of 40 officers working 24-hours-a-day in an attempt to figure out what happened that day and to bring those responsible to justice. However, it has now become a European-wide operation with Maillaud claiming that “the explanation for these murders presumably lies in Britain”. 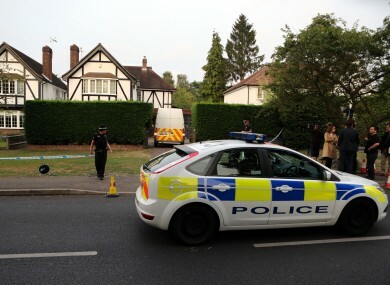 Searches at the family’s home in Claygate, Surrey will continue for at least another two days, according to BBC News. Both French and British investigators started examining the house over the weekend but it is understood that nothing of significance has been found. A statement from Colonel Marc de Tarle issued on Friday explained that while it is still a French-led investigation but Surrey Police were providing all possible supports because of its “complex” nature. Swiss and Italian police have also joined the manhunt as concerns are raised that the killers have left France. Email “Bomb disposal squad sent to home of French Alps victims”. Feedback on “Bomb disposal squad sent to home of French Alps victims”.